Feliks Dzerzhinsky, the Polish communist who founded the Bolshevik secret police, once said: “The only object of terrorism is to terrorise." 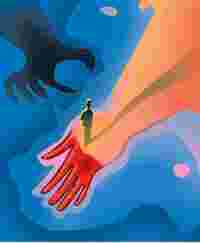 The only recourse left for us, then, is not to feel terrified. Terrorism aims to disrupt lives and destabilize order. It seeks to strike fear, to unnerve us. It wants us to suspect the other—the one who looks different, prays to a different god, speaks a different language, or who comes from a different place. To beat terror, we are supposed to act normal and carry on as if nothing has happened. My former colleague Shekhar Gupta says he will go and stay at the Oberoi. My friend in New York, Suketu Mehta, looks forward to having a drink at Café Leopold. As many more people in the city begin doing what they used to do before 26 November, we are supposed to have won, and they lose. Some think that’s facile. Many thousands have no choice but to lead their normal lives anyway. They must take that crowded bus, even if there may be a hijacker in it; they must cling from that train, even if it might have a bomb; they must return to work the next day, otherwise there is no food to feed the kids at night. Others see poetic resilience in this return to normalcy. But little acts of everyday bravery are often the only choices for those who have none left. But Gupta and Mehta are not suggesting elitist hedonism: If bravery requires us to be normal again, that’s what they want us to do. Look at its map: Mumbai is an extended arm, offering a clasp, a firm handshake, in the deep blue sea. It is a palm extended in friendship, to trade. In his epic book, Maximum City, Mehta writes: “In the crowded suburban trains, you can run up to the packed compartments and find many hands stretching out to grab you on board, unfolding outwards from the train like petals... And at the moment of contact, they do not know if the hand that is reaching for theirs belongs to a Hindu or Muslim or Christian or Brahmin or untouchable, or whether you were born in this city or arrived only this morning. All they know is that you’re trying to get to the city of gold, and that’s enough. Come on board, they say. We’ll adjust." We will adjust. That is what Mumbai does very well, even in the face of terror. Other cities go quiet immediately after terror—but it is the lull before the storm. An Ahmedabad or a Delhi goes berserk after an outrage, spilling more blood. Mumbai, ever pragmatic, returns to normalcy, humming with activity. Other cities have gates and fortifications; cavalries have attacked them. But Mumbai is a port city. It is surrounded by the sea, and it looks at the world beyond with a sense of wonder. Its symbol is not a tall tower, though skyscrapers it has many, but a gateway without doors that can be shut. And its Taj Mahal is not a mausoleum, but a living hotel. It will hum again. For Mumbai is where people come from all over India to live out their dream, and that’s what terror sought to change. In The Moor’s Last Sigh, Salman Rushdie had warned: “Those who hated India, those who sought to ruin it, would need to ruin Bombay." Mumbai lives on trust. It is used to welcoming outsiders and strangers. Tourists travel in its motor launches to the Elephanta islands, traders deal in shares, tycoons set up businesses, shoeshine boys work hard and strike it rich, dabbawalas perform their daily choreography—making sure the Jain banker gets his onion-less pulao and the Christian typist gets his Mangalore fish curry— and starry-eyed girls come from the hinterland to make it in its Tinseltown. The absence of majority is demonstrated in its plurality—the Zoroastrian philanthropist, the Punjabi film producer, the Malayali clerk, the Konkani bookseller, the Jewish bookkeeper, the Anglo-Indian model, the Gujarati stockbroker, the Marwari wholesaler, the Marathi bureaucrat, the Tamil lecturer, the Bengali MBA, and the cab driver from Uttar Pradesh. The city belongs to nobody, and to everyone. 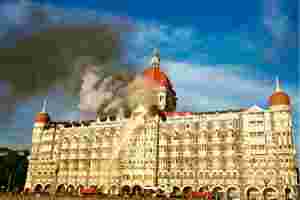 If Raj Thackeray’s thugs want to destroy that from within, those 10 terrorists wanted to demolish it from without. As Rushdie wrote further: “Bombay, a relatively new city in an immense ancient land, is not interested in yesterdays… In Bombay all Indias met and merged… Bombay was central; all rivers flowed into its human sea. It was an ocean of stories, we were all its narrators, and everybody talked at once. What magic was stirred into that insaan-soup (the soup of humanity), what harmony emerged from that cacophony!" And that’s what they wanted to tear apart—the two hotels, the majestic Indo-Saracenic railway station, are but symbols. They wanted us to be afraid. It is easy for me to say this from London. But I’ve lived through the blasts of 1993 in Mumbai; I recall the flames, the cloud of smoke choking the city. I was in London when its underground network was bombed in July 2005: it was as if London’s veins and arteries were ruptured. I visit New York often; in August 2001, I was on top of the World Trade Center with my family, surveying the city beneath. Three weeks later, those towers ceased to exist. We will now have to queue longer, walk through more metal detectors, live through false alarms. But Mumbai’s genius lies in not panicking. It is khadoos, like Sunil Gavaskar, blocking bowlers trying to get him out, then stepping out and driving them straight when they don’t notice; it is bindaas like Sachin Tendulkar, heaving bowlers elegantly. And it is that normalcy Mumbai will restore— when schoolboys will be practising at the nets at Shivaji Park; when the bus conductor will tell his passengers “pudhe chala, pudhe chala (move ahead)"; when a future Saleem Sinai will see films at the Metro Cub Club; where the dancing fingers of Amina and Ahmed Sinai will float around teacups at the Irani restaurant, coming tantalisingly close, yearning to meet. I will be back soon: for that pao bhaji at Sardar’s at Tardeo, for the bhelpuri at Chowpatty, the lassi at Jain Dairy, the kebab at Bade Miyan’s, the vada pau and kala khatta at Bori Bunder, the chana bhatura at Cream Centre, and the thali at Thacker’s. And that cocktail at the Sea Lounge. For old times sake. Salil Tripathi writes two columns for Mint.